The legacy of Thatcher is a long one. Despite folk tradition (especially in Scotland), all that she did was not evil. But her successors’ efforts to create a real market in industries like railways and energy have proved illusiory. See Rosco Used in Train Robbery for a blog on the former. But a spate of profit reports have highlighted severe shortcomings in supposed ‘markets’ in the latter. Between 1996 and 1999, domestic energy consumers gradually got the freedom to choose their supplier, and finally in May 1998, the domestic gas market was fully opened to competition, closely followed by the domestic electricity market in May 1999. Before there was competition on domestic markets, Ofgem (Office of Gas & Electricity Markets) set price controls, which remained in place until removed between 2000 and 2002. By then, Ofgem had decided that competition was developing well the Competition Act would protect consumers from supplier price fixing and the like. The same Act provided Ofgem with powers to tackle any abuse. Since consumer surveys indicated they knew how to switch, and were doing so away from the former monopoly supplies, big suppliers were seeing falls in their market shares. Ofgem is expected to look after the comsumers’ interests and herd in any excesses by suppliers. Shame it doesn’t work that way. First of all, GEMA/Ofgem are based across the road from the House of Lords and crawling with nomenklatura whose mission in life appears to centre around brown-nosing their way to a knighthood or looking after the civil service noenklature who populate its offices. Lord John Francis Mogg was appointed for a second five year term as the non-executive Chairman of Ofgem in October 2008. Lord John became a Life Peer on 18th April 2008. On 28th May 2008, he was created Baron Mogg of Queens Park in The County Of Sussex. In his three-days-a-week job as chairman, he receives £214,999 a year salary. For his long years in the Civil Service, in 2003, was appointed a Knight Commander of the Order of St Michael and St George (KCMG). He is serving a second term as Chairman of the European Regulators Group for Electricity and Gas (ERGEG), is President of the Council of European Energy Regulators (CEER) and chairs the Board of Governors at the University of Brighton. Busy man, eh? Sounds good. But these two have been running the place for the last decade; are the two of them any good? Well, February 2008, they did nail National Grid with a £41.8m fine, with Sir John thundering “National Grid has abused its dominance in the domestic gas metering market, restricting competition and harming consumers. The abuse has prevented suppliers from contracting with other companies for cheaper deals.” So, er, that fine would cover their salaries for 80 years. But what about the punters? This week, the Institute for Public Policy Research think tank yesterday demanded far tougher rules to ensure the big six energy firms make savings and pass them to customers. While families struggle to keep their heads above water, officials have awarded themselves £1.12million of taxpayers’ cash. In 2010, Ofgem paid out £602,969 to 266 staff members—an average bonus of £2,267, while in 2011, some £515,047 was shared between 346 officials—an average of £1,489 each. The report says five million people are already being overcharged to help fund low-cost deals for new customers. It calls for tougher rules to ensure the big six energy firms make efficiency savings and pass them to customers which could cut £70 off average bills. The system is so complicated that some families pay £330 a year more than neighbours to buy the same amount of energy from the same company. The report says consumers could save £1,900m a year by 2020 if the market is overhauled. The ‘Big Six’ energy companies are fleecing loyal customers trying to expand their market share—but not at the expense of profits. 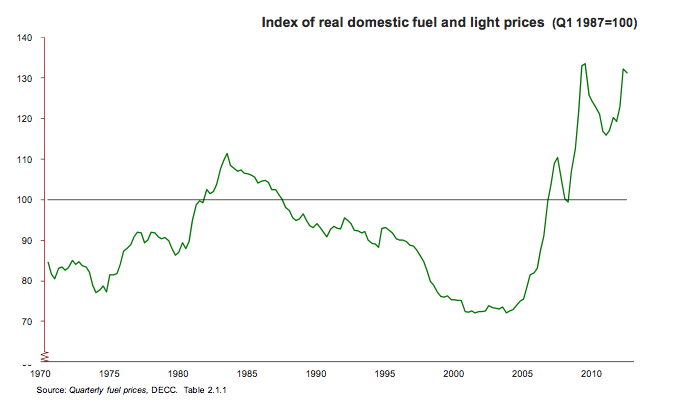 Up until the mid-nineties, energy prices actually dropped in real terms. But once both the 2007 oil price rise and subsequent recession hit, energy prices have been rising steeply, as shown in the chart below. Customers have seen costs more than double in the last eight years, with the average gas and electricity bill going up from £522 in January 2004 to its current level of £1,258. The Money Advice Trust (MAT) received 27,000 calls in 2011 from people unable to cope with fuel debts, compared with just 1,212 in 2004. In January this year, the helpline received a call for help with gas and electricity debts every five minutes. The percentage of family budget spent on heating for the poorest decile has jumped from 8% in 2006 to 12% last year, driving over 100,000 Scottish families into fuel poverty. Across the UK Some 7.8 million people could not afford their energy bills in 2009. This is due to rise to 8.5 million by 2016. But the wholesale prices for energy have, in fact, come down as well as gone up in recent years. 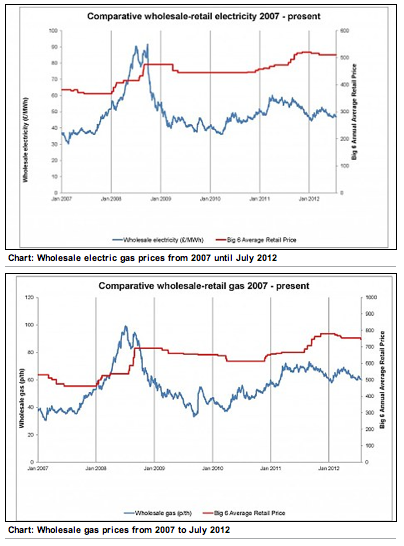 None of the Big SIx have reflected that in their price structure, as can be seen from the two charts below. Ofgem is asleep at the wheel. What more evidence that Aladair and Sir John are thoroughly undeserving of the public purse sustaining their ‘fat cat’ salaries and bloated staffs at Ofgem do we need? This entry was posted in Commerce and tagged energy; regulation; 'big six'. Bookmark the permalink.